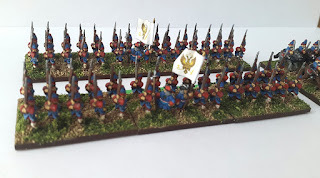 WORKBENCH: Russian GNW Foot & Horse Grenadiers Finished! In my earlier post on these guys I showed how I prepare them for basing. In a future post I’m going to show you my “rapid basing” technique in case it helps anyone (these foot and horse grenadiers literally took 15 minutes of time to do the whole basing process). 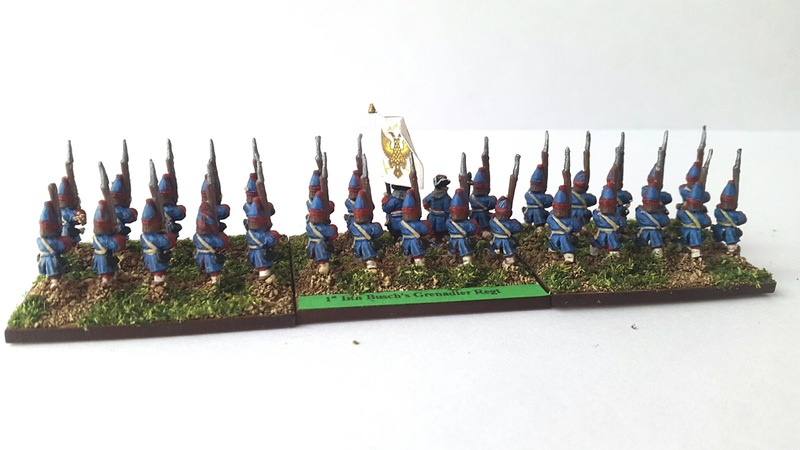 The figures are the British grenadiers pack from the Marlburian range. Note there is literally no painted shading on the figures. All I do is paint in a lighter tone than the colour I want. Then when you add the army painter dark tone, it dulls things and creates peaks and troughs of shade. It’s almost a miracle considering it’s just block painting! I’m really happy with these guys, they look the business, even though in reality I’m sure they were not really much better than the line regiments. But I’ll give them a Pike & Shotte skill to make them a little more elite, probably by making them “Crack”. Here is the horse grenadier regiment. I have labelled them as the Jaroslavski regiment, because in 1708 they were apparently converted and given grenadier hats and coats in blue. 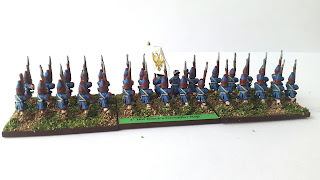 However, as you may have already noticed I play things a bit fast and loose with unit accuracy, especially when the truth is nobody has a bloody clue if they really did get converted or what they wore. Plus in 1712 they are listed as having been issued hats, so perhaps they weren’t converted. But that’s who they are in my army! 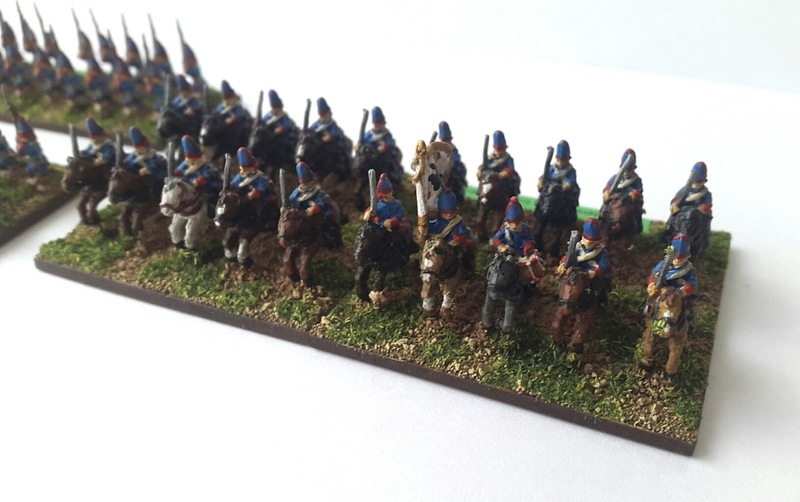 The figures are the Russian horse grenadiers in long coats from the 7YW Pendraken range. 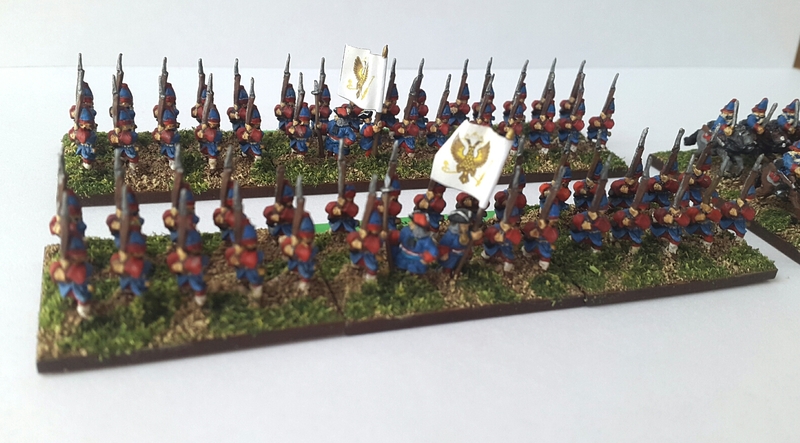 Next up is the Russian artillery. I’ve been taking photo’s as I go and will do an update soon. Workbench Update….Plus SO MUCH MORE!